Maggot’s unnamed friend has a complex origin, dating back in time to January, 1992. My friend Bob Adams and I were tapped by a Reno sporting goods store to develop some recurring characters for a line of t-shirts, posters and the like. 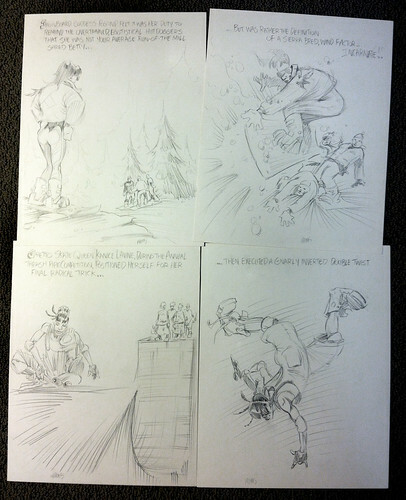 Bob — a cartoonist I hired for the UNR Sagebrush years earlier — and I developed four female characters: Ghetto Skate Queen Kanice Lavine™, Snowboard Goddess Pogonip™, Shitatsu the Roller-Hockey Ninja™, and Larva Girl™, a roller derby tomboy. 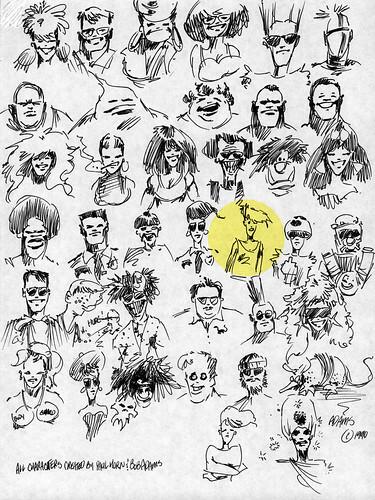 In these sketches that Bob and I produced, you’ll see a familiar icon… the same “GRRR! face” icon that was always present on Maggot’s unnamed friend’s tank top. The sporting goods store didn’t pursue the t-shirt idea because if memory serves, they fell on tough times and went out of business. 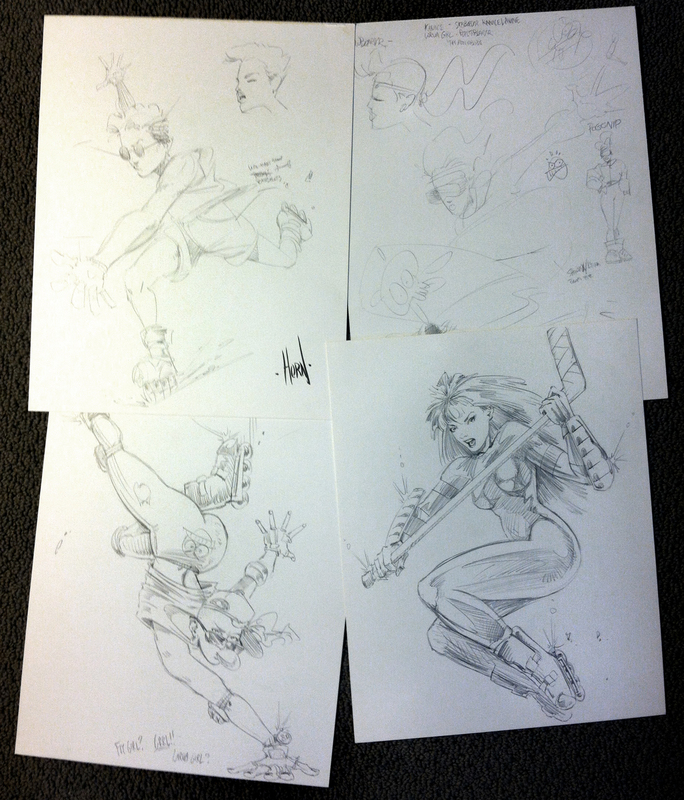 So those four characters remained as concepts only, squirreled away in my portfolio for 20+ years. I mentioned that Bob was a cartoonist. Yep, he created a universe of characters and named his weekly strip “Action Comics,” which debuted in the UNR Sagebrush in Jan. 1989 while Bob was still a senior at Reno High School. We became fast friends and ended up spending a lot of free time drawing people at the malls and on campus, honing our cartooning skills and eating lunch at Port of Subs. We’d even drawn each other’s characters and mused about a “blended universe” where he could draw Doc Splatter with his characters, and vice versa. 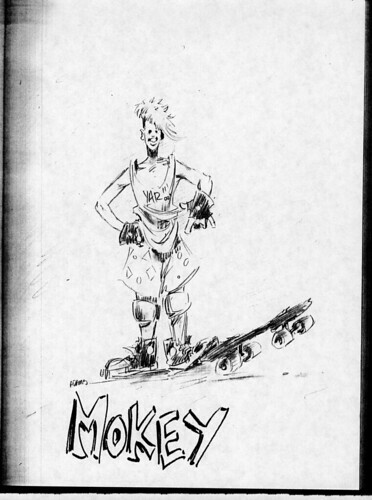 One of Bob’s myriad characters is Mokey™, a teenage skateboarder. While it wasn’t 100% my intent to have Maggot’s friend be Mokey™ from the very start, there’s no denying that “Maggot’s unnamed friend” is a spitting image of Mokey™: the age, build, haircut, skateboard, shorts and tank top (but with the “GRRR! face” icon). Bob and I drifted apart after I moved to San Diego and he moved to Utah. During that time, Bob published two comic books— “U.S. 395″ and “The Saga of Rusty Plates.” We’d since reconnected briefly via Facebook a few years ago (he’d returned to Reno and was working as security at UNR) but lines of communication dropped again when he deleted his Facebook profile. Last autumn (2013) I received an email from Bob Adams’ aunt, who told me that Bob had died in February. She sought me out specifically because in Bob’s stacks of sketchbooks, drawings, art studies and comics, my name and characters kept showing up. I was — and am — shellshocked. Bob’s death has weighed on me for many months and I felt I needed to memorialize his work and passing. So I put forth a plan to make the big reveal that “Maggot’s unnamed friend” was Mokey™, and that Mokey™ was not from around these parts. In fact, Mokey™ is from a parallel universe — Bob Adams’ universe. 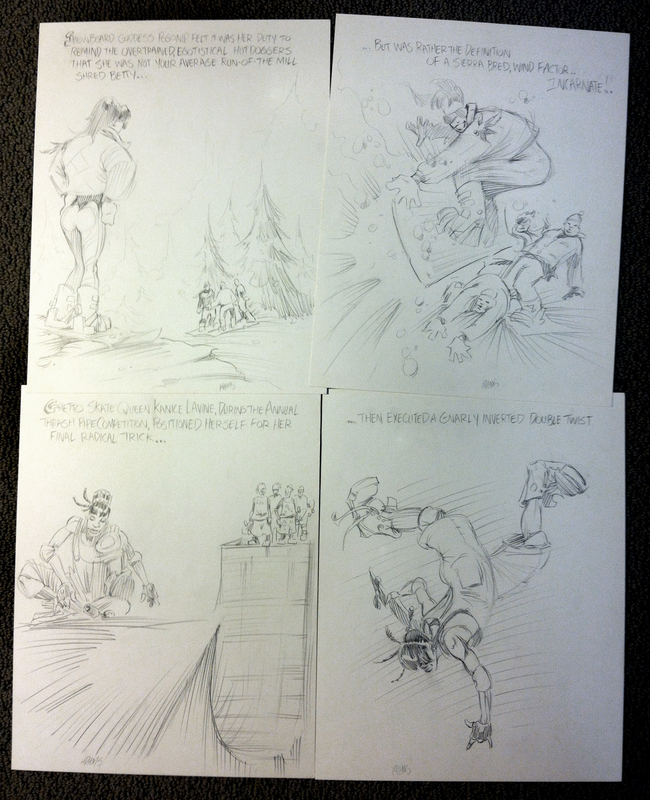 Here’s a drawing of Bob’s where he assembled his Action Comics characters and my Like, For Shore! characters (plus Doc Splatter and the ever-vomiting Timmy). I’m still having a rough time wrapping my head around the loss of Bob. Though he was a few years younger than me, Bob was one of my major “real-life” influences on my cartooning art style, not to mention his sense of humor and passion for ’80s action movies. While we never got a chance to collaborate on a comic, I intend to pay my respects to Bob throughout the year. So keep reading Cool Jerk to see those stories unfold. 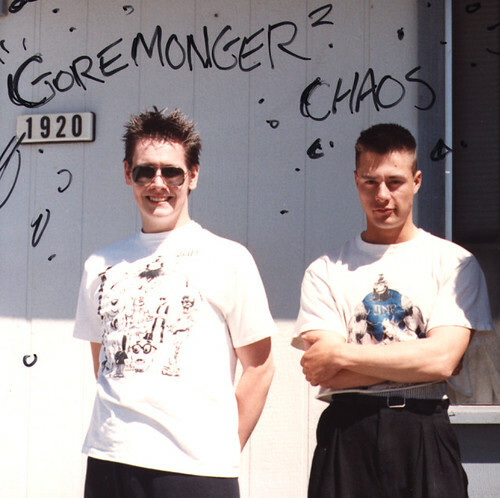 That's me and Bob (on the right) circa 1990, judging by the Sagebrush t-shirt I'm wearing and the Action Comics t-shirt Bob's wearing. Oh man that’s sad news, Paul. Sorry to hear it. I’d love to see more of Bob’s characters and comics work, but I’m not seeing much of anything online. I confess I love these background stories, even ones which are heartbreaking. Sorry for your loss, m’man.